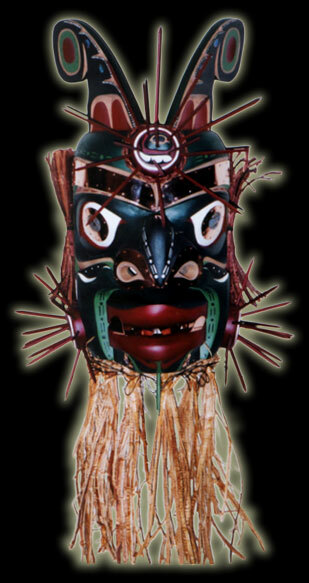 Yagis.is one of many Kwakwaka'wakw Sea Monsters capable of arouing storms, waves, and dangerous whirlpools and danced as part of the Winter Ceremony. His dance is characterized by movements, which initiate a Sea Mammal sounding, then surfacing and breathing. The copper teeth, eyes and eyebrows on this mask, are indications of great wealth. This authentic northwest coast native indian mask was carved from red cedar, painted with acrylic paint and varathane, and inlaid with abalone.